Chow Yun-Fat (born as 周润发 in Lamma Island, Hong Kong) is a famous Actor from China, he is 63 years old and still alive, born May 18, 1955. When Yun-fat was 17 years old, he quit school and took various odd jobs. He sought later in at a theater school that belonged to TVB, Hong Kong's largest TV station. After a year he wrote a contract with TVB. 1976, Yun-Fat to prominence when he made a starring role on the popular television series Hotel. In 1976 he made his debut also on the silver screen with the movie Club Girl Story and after his debut appeared in over 70 films. Chow Yun-fat hot his movie-star status in The Story of Woo Viet (1981). He participated in no fewer than 12 films in 1986, including John Woos A Better Tomorrow witch was a success both critically and audience. Yun-Fat received several awards for his work, and became an idol has no equivalent in the young audiences all over Asia. The American film debut was as late as 1997 in The Replacement Killers where he played against, inter alia, Mira Sorvino. 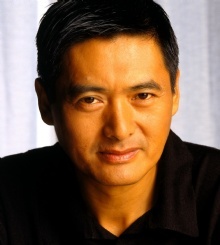 Chow Yun-Fat has established he's star status and has for many years now been Asia's most popular actor. He also participated the big move hit Pirates of the Caribbean: At World's End in 2007. He is born under the zodiac taurus, who is known for Security, Subtle strength, Appreciation, Instruction, Patience. Our collection contains 9 quotes who is written / told by Chow. "That's so different in Hong Kong when I'm using my own mother language, I can treat the line in one thousand different ways, with many different reactions"
"As an actor we're just like workers in a factory, we provide our services to directors"
"An actor is only merchandise"
"In the West audiences think I am a stereotyped action star, or that I always play hitmen or killers. But in Hong Kong, I did a lot of comedy, many dramatic films, and most of all, romantic roles, lots of love stories. I was like a romance novel hero"
"Some of the substance of English words, I just don't understand at all because the culture's so strange to me"
"Working in front of the camera keeps me alive"
"This is still a big barrier for me and it is for a lot of foreign actors"
"You must be one of the few people with a copy of that. I don't think they printed too many"
"I couldn't care less about actors' trailers and food on sets and stuff like that - I just want to act"